Immigration opponents are already using the violence to justify exclusionary policies. The terror attacks in Paris, which resulted in 127 deaths and an estimated 200 injuries, have already been linked to the French military intervention in Syria that began in September, and to Islamic extremism. The attacks, which have so far been attributed to the ISIL terror group, are terrible news for Europe’s refugees. "Les ennemis de la France, ce sont les pays qui entretiennent des liens avec l'islamisme". Right-leaning parties across Europe have long linked the narratives of an increase in refugee numbers with that of terrorism—despite the fact that many refugees, including those from Syria, are fleeing persecution by the same forces that likely perpetrated the attacks in Paris. Poland said today (Nov. 14), in the wake of the Paris attacks, that it will now refuse to take the small number of resettled asylum-seekers it had promised to house under a contentious EU “quota” system. European nations have offered a mixed, and constantly changing, response to the refugee crisis. Germany initially said it planned to receive up to 800,000 people across its open borders, but has since backtracked. Other countries, especially eastern nations like Hungary and Slovakia, have put up a strong resistance to pressure to accept refugees. Borders have been closed, and fences erected. 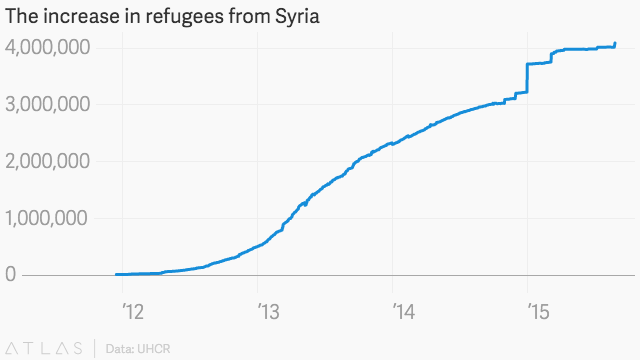 France may not be at the very forefront of the refugee crisis like Greece or Italy. But Europe’s open-border policy means it’s easy for people to travel through and remain in its territory. This has already produced points of extreme tension, like the “Jungle” settlement near Calais, which goes unrecognized as a refugee camp despite housing 6,000 people—many of whom are trying to get the U.K., which doesn’t subscribe to the EU’s open-border rules. A fire broke out in the camp last night. It was unrelated to the violence in Paris, but early reports linked the two—probably because, now, the likelihood of reprisals, tensions, and violence seems even greater than before.